Guinness Burgers - simply THE BEST! Can make ahead of time and freezer for later. Hamburger, Guinness beer, Worcestershire sauce, mustard,onion, garlic, salt, pepper. I don't like beer, but these burgers were DELICIOUS!!! A new favorite!! 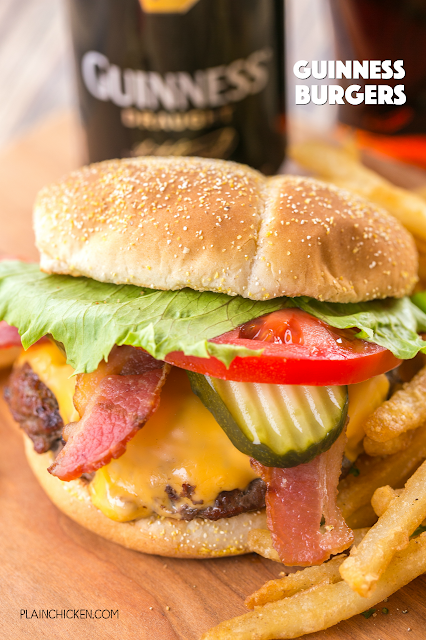 What happens when you put your favorite beer in your hamburger? It becomes your new favorite burger! Chicken Legs favorite beer is Guinness. Since St. Patrick's Day is just around the corner, I have been brainstorming recipe ideas. I decided to combine Chicken Legs favorite beer with one of his favorite foods (burgers). The result was one AMAZING burger! I don't really like beer, and I absolutely loved these burgers!! This recipe makes 6 large burgers. You can certainly make smaller burgers, but we like nice big burgers. The burgers can be made ahead of time and frozen for later. We actually have some in our freezer now. I love pulling out a few burgers for a quick lunch or dinner. 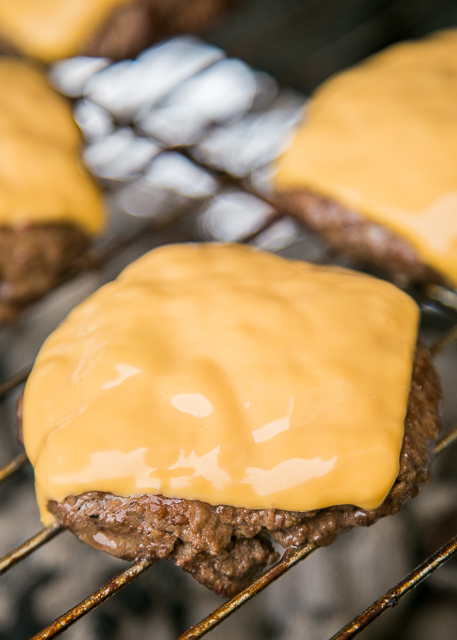 We grilled the burgers, but you can cook them in a skillet too. Either way will make a super tasty burger! Mix together beef, beer, Worcestershire, mustard, onion flakes, garlic powder, salt and pepper. Divide into 6 equal patties (I use a kitchen scale for this). Serve on hamburger buns with favorite toppings. The sound amazing to me, but hubby hates Guinness. Do you think they would be as good with a different beer? Or would it even taste different?